Kamath, Pauline L.; Foster, Jeffrey T.; Drees, Kevin P.; Luikart, Gordon; Quance, Christine; Anderson, Neil J.; Clarke, P. Ryan; Cole, Eric K.; Drew, Mark L.; Edwards, William H.; Rhyan, Jack C.; Treanor, John J.; Wallen, Rick L.; White, Patrick J.; Robbe-Austerman, Suelee; Cross, Paul C.
Kamath, P.L., Foster, J.T., Drees, K.P., Luikart, G., Quance, C., Anderson, N.J., Clarke, P.R., Cole, E.K., Drew, M.L., Edwards, W.H., Rhyan, J.C., Treanor, J.J., Wallen, R.L., White, P.J., Robbe-Austerman, S. & Cross, P.C. (2016) Genomics reveals historic and contemporary transmission dynamics of a bacterial disease among wildlife and livestock. Nat Commun, 7, 11448. 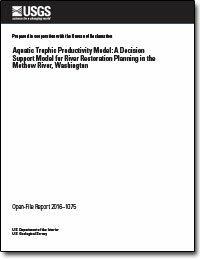 Benjamin, J.R., and Bellmore, J.R., 2016, Aquatic trophic productivity model: A decision support model for river restoration planning in the Methow River, Washington: U.S. Geological Survey Open-File Report 2016‒1075, 85 p., http://dx.doi.org/10.3133/ofr20161075. van Riper, Charles; Lester, Michael B.
Yando, Erik S.; Osland, Michael J.; Willis, Jonathan M; Day, Richard H.; Krauss, Ken W.; Hester, Mark W.
Yando, E.S., Osland, M.J., Willis, J.M., Day, R.H., Krauss, K.W., and Hester, M.W., 2016, Salt marsh-mangrove ecotones: using structural gradients to investigate the effects of woody plant encroachment on plant-soil interactions and ecosystem carbon pools: Journal of Ecology, v. 104, no. 4, p. 1020-1031, http://dx.doi.org/10.111/1365-2745.12571. Predicting tree biomass growth in the temperate-boreal ecotone: is tree size, age, competition or climate response most important? Foster, J.R., Finley, A.O., D'Amato, A.W., Bradford, J.B., Banerjee, S., 2016, Predicting tree biomass growth in the temperate-boreal ecotone: Is tree size, age, competition, or climate response most important? : Global Change Biology, v. 22, no. 6, p. 2138-2151, http://onlinelibrary.wiley.com/doi/10.1111/gcb.13208/full and http://dx.doi.org/10.1111/gcb.13208. Erhardt, John M.; Tiffan, Kenneth F.
Erhardt, J.M., and K.F. Tiffan. Ecology of nonnative Siberian prawn (Palaemon modestus) in the lower Snake River, Washington, USA. Aquat. Ecol. (Online First). Gosselin, Elyce N; Holbrook, Joseph D.; Huggler, Katey; Brown, Emily; Vierling, Kerri T.; Arkle, Robert; Pilliod, David S.
Gosselin, E.N., Holbrook, J.D., Huggler, K., Brown, E., Vierling, K.T., Arkle, R.S., Pilliod, D.S., 2016, Ecosystem engineering of harvester ants- effects on vegetation in a sagebrush-steppe ecosystem: Western North American Naturalist, v. 76, no. 1, p. 82-89. East, Amy E.; Collins, Brian D.; Sankey, Joel B.; Corbett, Skye C.; Fairley, Helen C.; Caster, Joshua J. 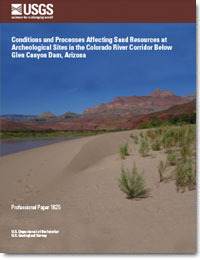 East, A.E., Collins, B.D., Sankey, J.B., Corbett, S.C., Fairley, H.C., and Caster, J., 2016, Conditions and processes affecting sand resources at archeological sites in the Colorado River corridor below Glen Canyon Dam, Arizona: U.S. Geological Survey Professional Paper 1825, 104 p., http://dx.doi.org/10.3133/pp1825.